Accrued expenses are expenses that are recognized at the time they are incurred, even though cash has not yet been paid. These expensesFixed and Variable CostsFixed and variable costs are important in management accounting and financial analysis. Fixed costs do not change with increases/decreases in units of production volume, while variable costs are solely dependent on the volume of units of production. This guide teaches an analyst the fixed vs variable cost methods are usually paired up against revenue via the matching principle from GAAP (generally accepted accounting principles). For those who are unaware of the matching principle, it states that you record expenses in the period that they occur. Usually, these expenses are recorded in the same period that accrued revenues are recognized so that you can match your expenses to your revenues. In demonstrating and showing examples of accrued expenses, we are using MS Excel. If you are unfamiliar with Microsoft’s spreadsheet program, be sure to check out our free Excel crash course. This type of accrued expense is very common and occurs regularly within company operations. 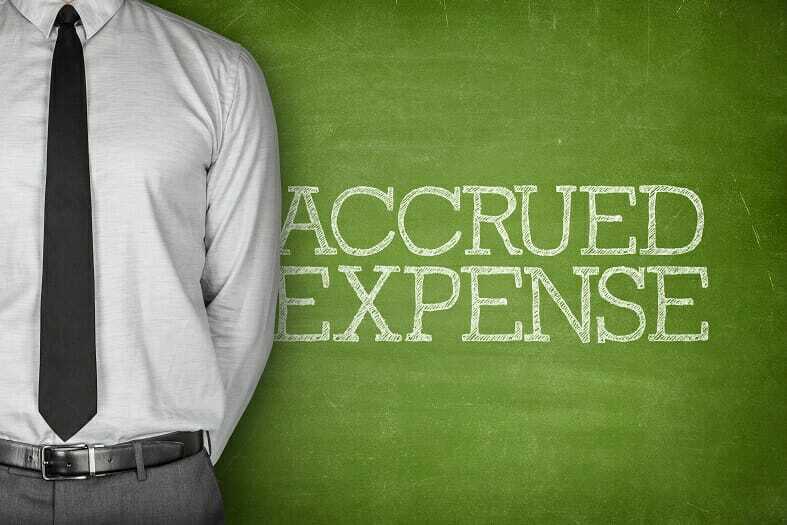 We give an example to demonstrate how and when this type of accrued expense may occur. Notice that on Friday, July 7, management would record the recognition of the accrued salaries expense. This is the salaries that have accrued over the three days, which can be found through some math: (58/5)*3. Now, when the company reaches the end of their 5-day work week, which lands on Tuesday of next week, July 11, management records the payment of the salaries. This is shown in the second entry by debiting the salaries and wages payable account by the amount that was accrued and debiting the salaries expense account. We also credit cash to demonstrate that cash was paid for salaries. Note that salaries payable is similar to accounts payable. Accrued interest is another type of accrued expense that is common for companies with notes payables. Notes payablesNotes PayableA Notes Payable is a written agreement (a promissory note) in which one party agrees to pay the other party a certain amount of cash. Alternatively put, a note payable is a formal loan between two parties. The following information is contained in a note payable: are promissory notes issued by either an individual, banks, or even other companies that obligate the issuing party (the one who must pay it back) to pay back the amount stated by a certain date. Just like earlier with salaries and wages, we use an example to demonstrate what we mean. The very first entry on January 1 is the recording of the issuance of the note. Recall that the note’s face value was $10,000 along with an annual interest of 2%. The next entry on February 1 records the accrued interest for the month of January. We record interest every month to recognize the monthly interest that we are obligated to pay. All this monthly interest eventually adds up to the annual interest amount at the end of the year. To record to monthly interest expenseInterest ExpenseInterest expense arises out of a company that finances through debt or capital leases. 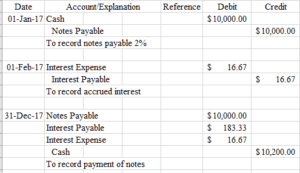 Interest is found in the income statement, but can also be calculated through the debt schedule. The schedule should outline all the major pieces of debt a company has on its balance sheet, and calculate interest by multiplying the, we take the face value of $10,000, multiply it by the annual interest rate of 2%. This gives us $200, which is our annual interest. We then divide this annual interest by 12 (200/12) and we end up with $16.67. This will be the monthly interest that we record every month leading up to the last month where we pay the interest. The last entry represents the payment of the note along with all interest that has accrued over the life of the note. Again, we see that there is a debit of interest payableInterest PayableInterest Payable is a liability account shown on a company’s balance sheet and represents the amount of interest expense that has been accrued to date but has not been paid as of the date on the balance sheet. It represents the amount of interest currently owed to lenders and is typically a current liability along with a debit of interest expense. It is done because we are paying off all of the accrued interest along with the last bit of interest that has accrued in December. An important thing to note is that debits must always equal credits. Otherwise, it can cause issues in your financial statementsThree Financial StatementsThe three financial statements are the income statement, the balance sheet, and the statement of cash flows. These three core statements are intricately linked to each other and this guide will explain how they all fit together. By following the steps below you'll be able to connect the three statements on your own., especially in the balance sheetBalance SheetThe balance sheet is one of the three fundamental financial statements. These statements are key to both financial modeling and accounting. The balance sheet displays the company’s total assets, and how these assets are financed, through either debt or equity. Assets = Liabilities + Equity and income statementIncome StatementThe Income Statement (or Statement of Profit and Loss) shows performance from operations of a business. The financial statement begins with revenues and, because these two statements are closely related to one another. Depreciation ExpenseCurrent LiabilitiesCurrent liabilities are financial obligations of a business entity that are due and payable within a year. A company shows these on the balance sheet. A liability occurs when a company has undergone a transaction that has generated an expectation for a future outflow of cash or other economic resources. Financial Modeling CertificationFMVA™ CertificationThe Financial Modeling & Valueation Analyst (FMVA)™ accreditation is a global standard for financial analysts that covers finance, accounting, financial modeling, valuation, budgeting, forecasting, presentations, and strategy.